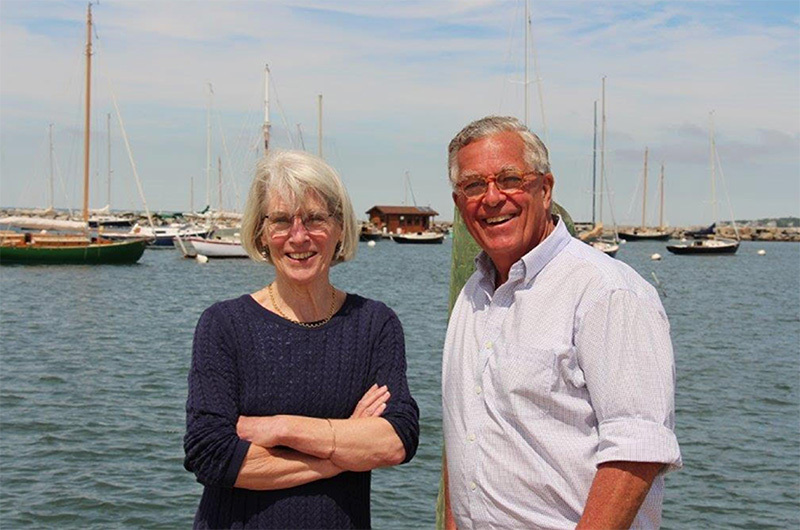 Brock and Hope Callen, longtime employees and supporters of Sail Martha’s Vineyard, will receive this year’s Walter Cronkite Award. Sail MV presents the award annually to individuals who live up to Mr. Cronkite’s legacy of environmental stewardship, positive social change, and passion for maritime tradition. Mr. Callen is the longtime executive director of Sail Martha’s Vineyard and has been involved with the organization since he joined as a volunteer in 1995. He recently announced his retirement. Mrs. Callen became office manager in 2001 and retired as administrative director two years ago. “Brock and Hope have worked for years to build Sail Martha’s Vineyard into the successful organization that it is today,” Peggy Schwier, president of Sail MV board of directors, said in a press release. Sail Martha’s Vineyard makes sailing accessible to Islanders through discounted introductory programs and also educates the public about ocean conservation. The award will be presented to the Callens at the Vineyard Cup opening night party held on July 12 at 5:30 p.m. at Tisbury Wharf. The event includes a seafood buffet, silent and live auctions, and live music. Tickets are available at sailmv.org and proceeds benefit Sail MV. Very well deserved. Congratulations to both of you for the recognition of the outstanding job you have done in building Sail MV into one of the best organizations on Island. Well done. Yeah!...I feel like breaking-out in shanty song....well deserved kudos, congrats ! Congratulations to a dynamic duo with hearts of gold! Your dedicated service to the Island's youth and environment has made the Island (and the world!) a better place. Thank you. As you can see, the news of your award has spread far and wide, even to the Adirondacks! Our congrats to Hope & Brock - so glad to see this wonderful photo of you two looking great as always. Hope to see you on our next voyage to MV.